Nigersaurus was a sauropod like Diplodocus and Seismosaurus. Which means it ate plants. Well, it went along the ground, with its head down, sucking food up into its big jaw like a vacuum cleaner! 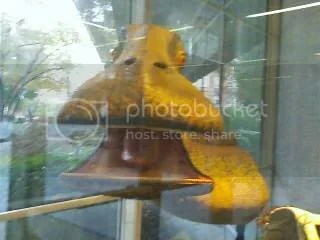 This picture was taken at the National Geographic Society’s exhibition about this dino. This link is to a press release about the discovery and the exhibit. The exhibit includes a skeleton of the Nigersaurus and another discovered African Pterosaur. There are many more dinosaurs to discover. Who knows? Maybe you will discover one someday!